The current unprecedented increase in atmospheric carbon dioxide is a result of the burning of fossil fuels since the advent of the industrial revolution round about 1700 AD. This extra release of carbon dioxide into the atmosphere that was previously locked away in a carbon sink is not a part of any natural cycle and is the reason for the current worries about climate change. 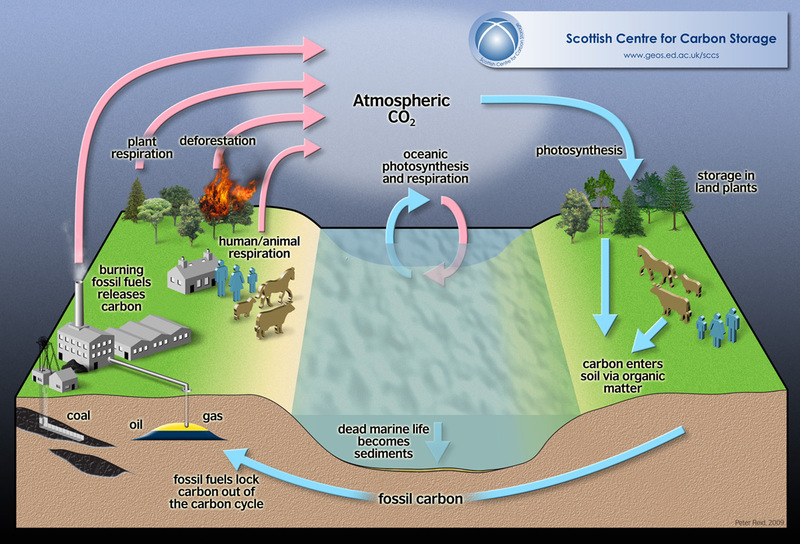 The carbon cycle of the planet maintains the amount of carbon in the various carbon sinks and causes carbon to be transferred between them. In most cases carbon is transferred as carbon dioxide CO2 or as methane CH4. This cycle has been turning since when the earth cooled from a lump of glowing rock at its birth, although it is more accurate to see it as something much more complicated than the simple single wheel that "cycle" implies. At various times in the history of the earth, different parts of the carbon cycle have had different levels of importance and the amount held in sinks and movement between them has varied enormously. For instance in the Carboniferous period 360MYA to 299MYA (MYA=millions of years ago), carbon dioxide was being captured by trees and tree-like plants and laid down in conditions without oxygen that would eventually become the coal deposits that the earth has today. In the very early atmosphere of the earth over 4 billion years ago there were very high levels of CO2 and temperatures that may have been as high as 70C, as the earth cooled and the oceans formed, so this carbon was firstly dissolved in the oceans and then laid down as carbonate rocks. Top, carbon cycle showing approximate amount of carbon moving from one sink to another in GtC (gigatonne= one thousand million tonnes) per year. The component cycles are simplified and the figures present average values. Evidence is accumulating that many of the fluxes can fluctuate significantly from year to year. 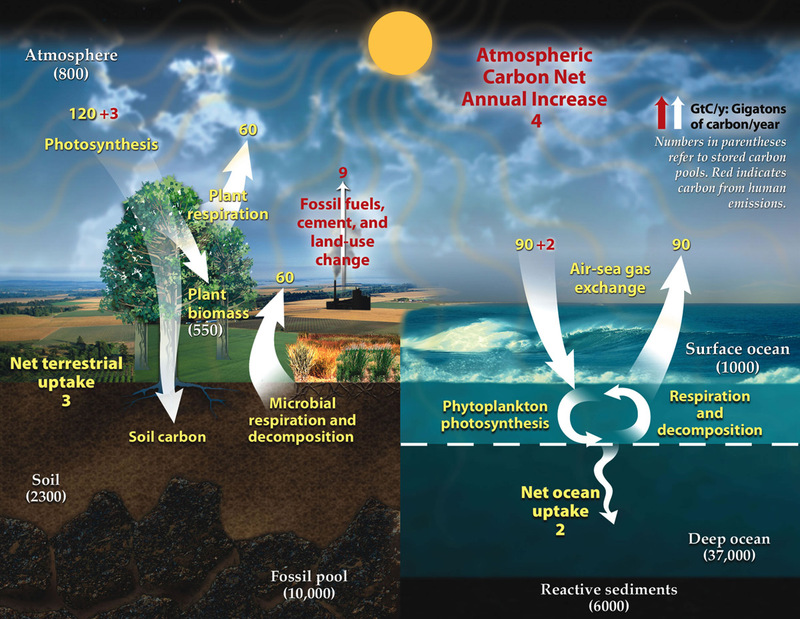 In contrast to the static view conveyed in figures like this one, the carbon system is dynamic and coupled to the climate system on seasonal, interannual and decadal timescales. Bottom, simpler version showing movements without amounts. In between the early atmosphere and the present day, atmospheric carbon dioxide has fluctuated considerably and so has the temperature of the earth. At times the equator has been almost uninhabitable for most plants and animals on land due to to high temperatures while the poles have been very productive. At other times, the equator has been tropical and lush as it is now, while the poles are ice-bound and barren. It is not just carbon dioxide that has had this effect on the climate, though it has a significant part to play. Sun spots and the position of the earth in space relative to the sun (the Milankovitch cycles) occur in cycles and affect the amount of solar radiation reaching the earth and so the temperature and climate. Other factors such as volcanic activity and the reflectivity of the surface due to snow/ice cover have their effects too so making the understanding of why the temperature at any particular time in the past not straightforward, particularly in estimating the point in the various cycles. If there wasn't a natural greenhouse effect, then the average surface temperature of the earth would be about -18C rather than the current +15C (ref) so some degree of greenhouse effect is vital for life on earth as we know it to be viable at all. About a half of all the extra "industrial" carbon dioxide released has been produced in the last 20 years or so. Antarctica is involved in the carbon cycle in the ways that other ecosystems in the world are, notably in the absorption of carbon dioxide by plants (in Antarctica, these are overwhelmingly phytoplankton in the oceans), the production of carbon dioxide by the respiration of plants and animals and also the decay of dead plants and animals. As the Antarctic ecosystem is largely a marine system the involvement of Antarctica in the carbon cycle is the story of the role of the Southern Ocean. The Southern Ocean has a major role to play in locking away (sequestering) anthropogenic (due to the actions of man) carbon dioxide. To start with gases dissolve more readily in cold water than they do in warm water, so cold Antarctic waters can hold more of the dissolved gas. Around the Antarctic continent oceanic water upwells bringing with it large amounts of dissolved minerals which along with long hours of daylight in the austral summer leads to the huge blooms of phytoplankton that drive the very rich marine ecosystem. There is also a huge amount of water around Antarctica that cools and sinks, some of it is the same water that has upwelled when it had less carbon dioxide dissolved in it. 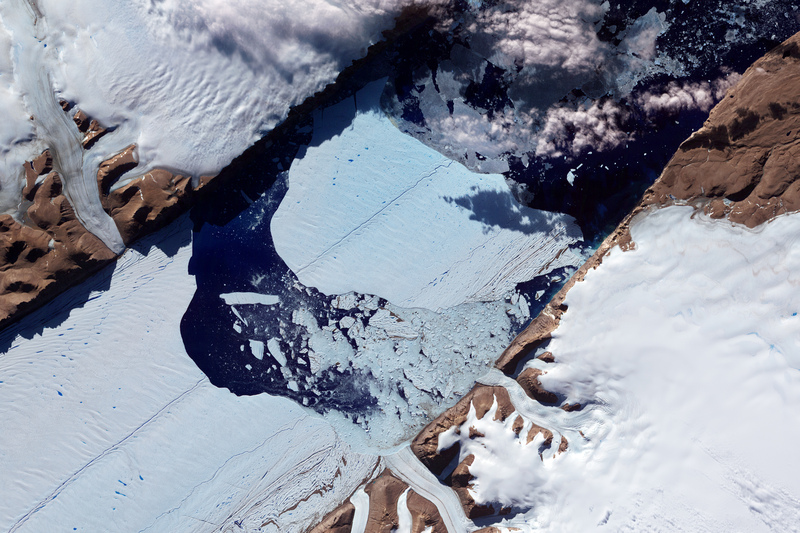 Upon exposure to modern higher levels of atmospheric carbon dioxide this water takes in more than it previously held and carries it to the ocean depths, so removing anthropogenic carbon dioxide as it form "Antarctic Bottom Water". 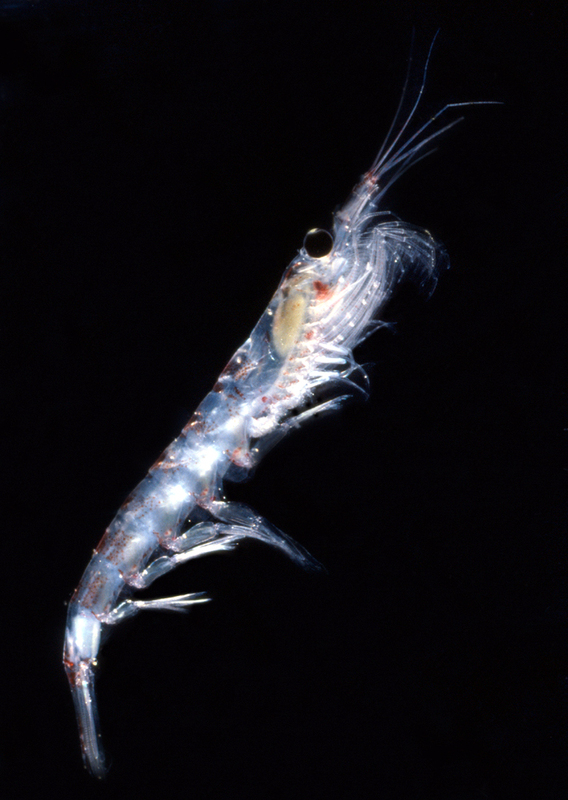 The archetypal Antarctic animal (at least to biologists) is krill Euphausia superba, this is the source of food for all sorts of animals such as whales, seals, penguins and a whole host of other birds. Krill feed on phytoplankton by filter feeding at the surface where the phytoplankton are found, but this puts them at danger from predation. It has long been known that krill migrate to the surface and then to deeper levels in the ocean when not feeding to put themselves out of the line of danger unnecessarily. Recent research has shown that rather than making the surface / deep cycle once every 24 hours, the krill are doing so up to three times a day. They swim to the surface (krill naturally sink unless swimming) to feed and then when they are full, allow themselves to slowly sink out of the danger zone (they actually "parachute" down as they spread out their swimming and feeding appendages). This is significant as when the krill sink they pass below the level of the mixed surface layer of the sea to the region where little or no mixing takes place with the surface layers. As they pass to this layer they release faeces which rather than becoming recycled by decomposers and being part of the surface carbon cycle, become sequested in the ocean depths and so less likely to be released quickly back into the atmosphere. It is estimated that 2.3 x 107 tonnes of carbon (23 million tonnes) are locked away below the mixed layer by krill in this way every year. This is an extra 8% of sequestration on a global scale of all sources. This is the annual equivalent carbon output of about 35 million cars.